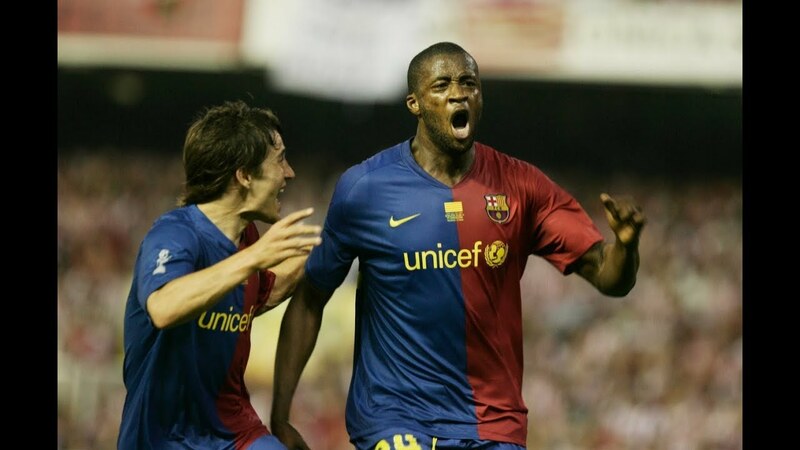 As of the present day, Yaya Touré is in the final phase of his long, illustrious career. The 35 year old veteran has been immense, with a trophy cabinet most footballers would only dare to dream of having. A treble winner at Barcelona, a three time Premier League champion with Manchester City, an African Cup of Nations hero with his beloved Ivory Coast, the list goes on for the midfielder. Now a free agent, Touré is certainly past his prime and in the process of finding what is likely to be one of his last clubs before he hangs up his boots. Yet just 4-5 years ago, he was one of the finest midfielders the Premier League had ever seen. The same Premier League that had given birth to the likes of Gerrard, Lampard, Scholes and Keane, a true testament to the sheer quality of the Ivorian in his prime. Although he made a name for himself at the Blaugrana showcasing both his offensive and defensive capability, his time at the Etihad was without a shadow of a doubt the finest stint of his career. The 2013/14 season was where Yaya Touré cemented his place in Premier League history. He revolutionised the box-to-box midfielder role with his dominant physical presence and sublime technical ability. Here’s how Yaya Touré in 2013/14 propelled Manchester City to title glory, a season both Citizen fans and Premier League fans will never forget..
Yaya was entering 2013/14 in fine form with an impressive 9 goals in all competitions in the previous campaign. City had just been beaten to the Premier League title by an ageing Manchester United side, masterminded by the colossus that is Sir Alex Ferguson. So the noisy neighbors were more fired up than ever to clinch the title this season and Yaya Toure was ready from the get-go. His season commenced in brilliant fashion with two curling free kick goals in his first two games against Newcastle United and Hull. His stellar form continued with a goal and Man Of The Match performance in a 4-1 victory against bitter rivals Manchester United, proving that Toure was without a doubt a big game player. The Ivorian’s set piece excellence did not stop there with another free kick goal, this time against Norwich in a 7-0 demolition. This made it his fifth goal from a set piece in the league, which was unimaginable prior to the season with Toure not being known for his ability to strike a dead ball. Yet Touré continued to do unthinkable all the way through the season. Alongside his promotion to vice-captaincy, Touré’s performances just got better with a brace against West Brom crucial in a 3-2 win for Manchester City. By the end of December, the Ivorian was up to 11 goals in all competitions, a tally strikers would be proud of. Beyond this point there would be a drop off for most, but the Ivorian powerhouse was just getting started. Goals continued for the dominant midfielder, netting against the likes of Swansea, West Ham and Tottenham. Not only was he scoring goals, he was contributing defensively too, combining brilliantly with fellow midfielder Fernandinho to provide adequate cover for the defence. To say the Ivorian was thriving is an understatement, he was simply unstoppable and not just in the Premier League. A superb long-range curling strike that nestled into the top corner was vital in City’s 3-1 win over Sunderland in the League Cup final. Surely nothing could top that? Well, it could. Just two weeks later, Toure scored his first career hat trick, a feat only the finest of midfielders achieve, against Fulham to galvanize his team and put pressure on league leaders Liverpool. A goal in his side’s Manchester derby victory followed and now the Ivorian’s figures were reaching obscene heights, those of a world-class midfielder. In April, Touré was named in the PFA Team of the Year and nominated for the PFA Player of the Year award. Yet this was all topped off by yet another Premier League triumph for his team in what is arguably one of the most exhilarating title races in Premier League history. A goal against Aston Villa at the Etihad in his side’s penultimate game of the season took Yaya Toure’s tally to 20 goals in the season. Astonishing numbers that put the Ivorian in esteemed company with Frank Lampard as the only midfielders to hit that mark in Premier League history. His season ended with an incredible 24 goals and over 10 assists in all competitions. Quite truly a remarkable achievement for the former central defender. It would be almost impossible for the then 31 year old midfielder to reach those figures again and so it proved. His next 4 seasons did not reach the same astronomical heights, yet displayed glimpses of the complete outfield player we were fascinated by in 2013/14. Yaya Touré is without a doubt a Premier League great. Some argue his tantrums such as with the birthday cake alongside his lethargic body language (with many pundits accusing him of laziness) have tarnished his legacy. Yet nothing can overshadow his achievements in a light blue jersey, especially that memorable 2013/14 season where he was instrumental in his side’s domestic double.